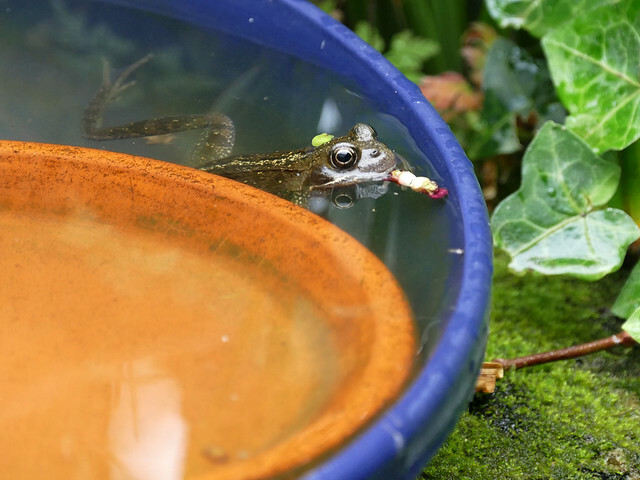 I don't know how he managed it, but I discovered this rather confused frog in the birdbath. Poor thing thought he'd found his very own private pond, and then about half a dozen starlings descended and had a pool party all around him... he looks a little shell-shocked. I think he appreciated being fished out and put back in the proper pond after that experience! Would have loved to have seen it when the starlings arrived. You know how starlings can be- I doubt they even noticed he was there, poor frog! When they take over the birdbath, they usually empty half the water... on hot days I keep the hosepipe in it on a slow drip, else there would be nothing left for anyone else.